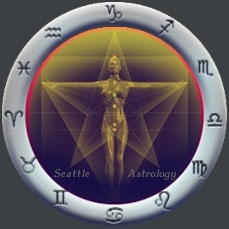 In the early days of Seattle astrology (1984-89), Steven worked at a Seattle astrology bookstore and helped with the production of the annual NORWAC (a northwest based astrological conference) event. This was an exciting time in the history of Seattle area astrology. As NORWAC grew in popularity, it attracted some of the top international astrologers to the Seattle area, which added to Steven's understanding a broad exposure of different astrology approaches and ideologies. As a result, he was able to meet and hear lectures from many prominent astrologers, including: Jeffrey Wolf Green, Robert Hand, Alan Leo, Noel Tyl, Steven Forrest, Liz Green, Donna Cunningham, and Joan McEvers to mention a few. During these early years, the astrology classroom setting was quite memorable. Jeffrey Wolf Green was teaching astrology classes out of the bookstore where Steven was working. The curriculum Jeff was teaching at that time was the new astrological concepts and ideas he was formulating for a series of future books he would write on evolutionary astrology. Steven continued studying astrology and taking classes from Jeffery Green until the late 1980's. During this time of intense study the late great Dane Rudhyar passed away. The passing of the greatest of all modern day astrologers sparked in Steven a desire to study his vast body of philosophical, psychological and astrological work. Dane Rudhyar became a solid mentor and has greatly influenced Steven's thinking on astrology. As a result of Dane Rudhyar influence, Steven is a Rudhyarian astrologer, specializing in Sabian astrology. He is also the founder of the Sabian Esoteric Restoration Movement. Steven's interest in medicine dates back to when he was an army medic in the 1970's. This interest finally led him to finish his formal education in pre-med studies, after which he was accepted into the four year Doctor of Chiropractic program at Western States University. He graduated as a Doctor of Chiropractic in 1995. During his studies in at Western States he met his spiritual teacher Paramahamsa Hariharananda who was a Kriya Yoga master and a Vedic astrologer. Today, Steven lives in the Greenwood district of Seattle, Washington and continues to study astrology. He sees astrology clients using a combination of holistic astrology, Rudhyarian astrology, and the newly developed discipline called Sabian astrology. He also has a medical astrology practice. He spends time writing astrology articles and working on an upcoming medical astrology book while he continues to promote his new project, the SABIAN Esoteric Restoration Movement.